Nici Cumpston and Paul Keating in front of Tjaruwa Woods' Spinifex painting, 'Purpurnya' (2015), created for the Tarnanthi Festival. Inset: SA Art Gallery Director, Nick Mitzevich. “Story is so rich in Aboriginal art; it does help to know the back-story when viewing it”. Nici Cumpston, Artistic Director of the new Tarnanthi (pronounced Tar-Nan-Dee) Festival that's making its debut currently in Adelaide, speaks truth, as any curator who is also a significant artist herself would do. And in her truly national Indigenous festival – even the Torres Strait crept in at Adelaide's first art fair – she gave viewers several significant stories in ways that are not really fashionable these days. Unfortunately, other Indigenous curators relentless plug the 'contemporary' line which apparently requires the art to be presented entirely without back-story so that we appreciate it only as aesthetics. Interesting, then that international curatorial maven, Carolyn Christov-Bakargiev took not only contemporary Arnhem barks to her current Istanbul Biennial but also archival artworks from the Yolngu history of campaigning against miners coming on their land, and of battles for land and sea rights to provide appropriate context. More of that later. Two stories stood out for me in the long weekend of Tarnanthi's opening – 23 venues potentially to visit, more than 350 artists represented. One was intentionally featured; one was shared by an artist who just couldn't leave the meaning of his artwork to be guessed at. Both encompassed contemporary dramas that linked to mythological stories, both ended with a political message, and both required art to achieve their sharing. At the SASA Gallery of UniSA, 'Kapi Ungkupayi/He Gave Us Water' filled the room. 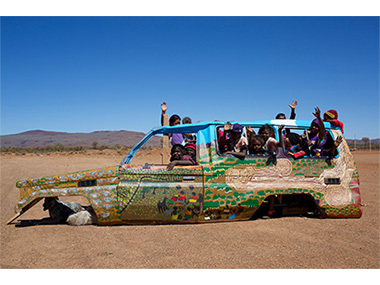 An installation and film encompassed car-body parts, kids painting birdlife, Tjanpi woven animals and paintings by five women elders from Irrunytju (and its new Minyma Kutjara arts centre) who were 'lost' out in the desert for five days with temperatures soaring into the 50s when their Toyota ran out of both water and fuel. The SASA Gallery is run by Mary Knights, a former facilitator at Irrunytju and a reliable retailer of their story – which they have insisted in the catalogue is “an important story, a new tjukurpa (dreaming story) about our culture, our faith and our relationship with our land”. As the old women sat beneath a tree, they knew their Country and its water sources – but the only one they could reach on foot was dry. Native tobacco was chewed, a ngintaka (perentie) caught and cooked – but they needed water. One old lady (Mrs Woods) was frail and, after receiving warnings of its imminence from encroaching dingoes, has subsequently died. So they simply couldn't walk any distance. Sometimes they sung tjukurpa, and on Sunday they sang hymns. Did that cause a cloud to appear – for the 'He' of the title is, in fact, their Christian god? Or did the tjukurpa encourage a cloud of desert finches to appear, heralding an unseen water source. The women dug feverishly where they'd settled, and a metre down they reached brackish – holy – water. It was such an epic story, they were actually reluctant to leave when rescued. It certainly was a story to be told when Tarnanthi invited their contribution. So the women painted and wove, Mrs Woods and Roma Butler contributing significant canvases; local kids added a flight of painted finches to show they'd learnt survival lessons from the story; unusual portraits of the now-legendary participants were created; a film recorded the Country and the new tjukurpa that was created and sung to tell this tale; and Adelaide, at least, has an understanding of “the close and interconnected relationships between our culture and our Country”. For Irrunytju/Wingellina is one of the 192 remote communities in Western Australia deemed 'unsustainable' by its government, and living there on Country a 'lifestyle choice' by our former PM. The rest of Australia may gain a lesser understanding via the delightful YouTube film of last April's 'Wingellina Protest' against closure of their community. Over at the Artfair in the venerable Tandanya National Aboriginal Cultural Institute, booths were tailored to the specific needs of each art centre (40 came, some in groups from The Kimberley, APY Lands, etc), and a VIP room was hung with classy art, selling 29 works totalling more than $100,000 during the two days of the fair. Unlike Darwin, where its well-establish art fair is surrounded by a dozen commercial outlets, Adelaide is almost bereft of specialist Aboriginal galleries now that Paul Greenaway and AP Bond seem to have deserted the cause. The Cairns Art Fair is all about selling Queensland art. So it was appropriate that the handful of locals alerted to the delights of Aboriginal art by Tarnanthi's exhibitions should also get the chance to buy it, and meet its makers. Standing with a gorgeous suite of his barks and a larrikitj, Djambawa Marawili AM couldn't hold back on his story. There, intertwined with the swirls of his tribal miny'tji, is a boat crossing from one side of his Blue Mud Bay homeland to the other. Like the old ladies' Toyota, it's broken down, and the 4 man crew is out of water. Fresh water sites are all around them – there's an ancestral kangaroo that's leapt from the mainland to an island with perpetual water to escape pursuing dogs (now turned into rocks). But out in the middle of the bay, Djambawa advises his crew to lick their salty paddles. Then, rising beneath the boat, a hairy monster takes it on his back, and transports them home! There, an anthropologist greets Marawili and tells him he has to fly to Darwin overnight – for the sea-rights battle in the High Court will be resolved tomorrow; and its a victory for the Yolngu and Indigenous Australia. Art and politics interwoven – as in Istanbul, where The Guardian's critic Adrian Searle assessed: “A floating sculptural zoo and work by Aboriginal artists are the highlights of this year’s strange, ever-surprising Istanbul Biennial”. He goes on: “Christov-Bakargiev has also, surprisingly and tellingly, installed a number of paintings by Australian Aboriginal artists at Istanbul Modern, and presents the indigenous Yolngu people’s 1963 petition – typed, signed and surrounded by a painting on bark – claiming indigenous rights to their ancestral lands and to the seas. This petition eventually effected changes in Australian law”. Other stories in Tarnanthi are less straightforward. The most powerful room in the main Art Gallery of SA exhibition is filled with large, brilliant Spinifex paintings that shine in its darkness. They were collaboratively inspired by Cumpston's offer to fund a bush trip from their home in WA (where they have no art centre) to the lands they lost in SA when the Maralinga nuclear tests displaced them. John Carty's essay in the catalogue explains all this and the Spinifex people's unique use of classical desert forms (undisguised by dotting) which both map the storylines and also emerge as individual artist's statements of who s/he is and how s/he relates to Country and community. But it's so much easier to understand the Maralinga material in Adelaide artist, Yhonnie Scarce's one-dimensional blown glass blackened yams that dominate the exhibition's entry foyer in a beautiful but predictable mushroom cloud candelabra. Upstairs, Yvonne Koolmatrie has 30 years of her sedge weaving superbly displayed by curators Jonathan Jones and Hetti Perkins. But her story – told confidently by herself at a packed session in the gallery – is of her own heroic efforts to re-discover the almost-lost Ngarrindjeri art of weaving in an ethos where the language-group's ceremony had been obliterated. But Diane Bell's recent book on the Ngarrindjeri suggests there's a world of Wukkin mi:mini elsewhere in which the “women's business of weaving” continues to contain “all the cultural and sacred life which has been part of (their) ancestry”. Outside, in one of the too few performative aspects of Tarnanthi, Jonathan Jones (again) choreographed an inma from the APY Lands involving spear-making, a brilliantly-lit installation, songs by a group of tjilpies (elders) and dancing by young men in the process of learning the ropes from their elders. The story began with the spears – remember Turkey Tolson's many 'Straightening Spears' paintings – and, en-masse, they became an artwork hanging from the ceiling in a recent Adelaide Biennial. The added dancing was intended to engage and educate a new generation of Anangu men. But with the singing un-amplified, the dancers looked sadly unmotivated when compared with either the Garma Festival's jolly bungles or, especially, with the great pan-tribal events on Groote Eylandt in the 80s where every language group was showing off its dynamic best to the others. Where's the Aboriginal Cultural Foundation (which organised them) when you need it??? And then there's the foundation myth about Tarnathi itself! Politics again – with BHP's failure to expand the Olympic Dam mine that's such a large part of SA's economy requiring a quid pro quo in the form of a generous $4m donation to the State. Luckily, Nici Cumpston had been quietly building her plans since 2010 (when she first saw and fell for the increasingly-appreciated Ngarra's art in Perth), and she had in Director Nick Mitzevich a man ready to jump on such a large band-wagon. And then there was a Premier in Jay Weatherill prepared to aggrandise the event at its opening (by Paul Keating) as establishing Adelaide as “the international gateway for Aboriginal & Torres Strait Islander art in this nation”. And why not? Nici Cumpston's map of contributing art centres clearly shows a funnel from the Far North flowing straight down into Adelaide. Darwin, Cairns, Alice and Perth all have their visual arts moments – but they tend to be a little parochial; as was proven by the attendance of national Aboriginal arts industry figures at Tarnanthi in numbers unseen in Darwin, Alice or Cairns for a decade or more. Indigenous festivals in Sydney and Alice have died in the bum. So, BHP, please feel guilty again in two years time – Australia does need an international gateway for the nation's unique ATSI culture.